We couldn't stop Col. Wolf... perhaps you can. 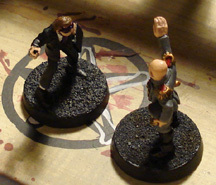 This scenario was designed to use Arjen’s latest painted miniatures, the Hostage Rescue Team. When I saw them I had to see them in action. And kill them. The Battle Report is HERE. Place a building in the centre of the table. This is where Wolf and his henchmen are. Surround it with a good amount of small terrain pieces. Car wrecks, shipping containers and other such pieces are great for this! Make sure the lines of sight are few and short (otherwise the HRT will be blown away as soon as they make an appearance). Finally place fences and walls around to establish a square perimeter. Around this perimeter runs a road. Place some other buildings and scenery on the other side of this road. 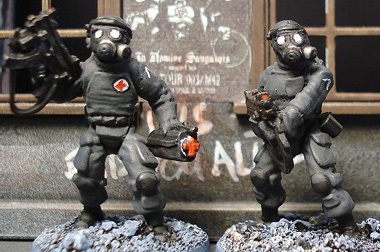 Now you can deploy all the police miniatures in your collection (Yes, you need them all! Well only for the looks, they’re not really in the game. But it looks good, doesn’t it?). The HRT has to rescue mayor John before he caves in to Wolf. To do so, one of them has to move in to base contact with him and spend 2 AP to free him, or Wolf must be killed or captured. The hostage-takers have to keep Wolf alive and intimidating mayor John for 8 turns. These don’t have to be consecutive. When Wolf has spent 8 full turns intimidating mayor John he wins. The Hostage Rescue Team (‘HRT’) deploys anywhere along the police perimeter. They may cross the road whenever the player wants to engage the enemy. Only when they start crossing the road may they attempt to take shots at the hostage-takers. Tip: If you think your initial position isn’t the best, move the members of the HRT along the police perimeter to a better position. The hostage-takers will not be alarmed as long as you stay within the police perimeter. But remember that the turn-counter will keep moving! Silencer: shots fired by a member of the Hostage Rescue Team will not alert the sentries since the sound is muffled by the silencer. It costs 3 points. The sentries are placed around the building and within the established perimeter. Each turn the controlling player throws a scatter die and moves the sentry in the indicated direction. The sentry will end facing the indicated direction. At the end of the turn in which a sentry spots a member of the HRT not within the police perimeter, or a shot down sentry within his line of sight he will raise the alarm. A sentry will also raise the alarm if at the end of a turn there is a member of the HRT within his awareness-range (this range is the same as the number of AP’s a unit has per turn, so an average unit has an awareness-range of 6 cm) or he has been hit but was not killed. When this happens, all sentries become active in their next turn, and may be directed by the player. Wolf and his henchmen are inside the building. They are intimidating mayor John into cooperation with Wolf. Wolf needs 8 turns to succeed with his intimidation. As long as the alarm is not raised Wolf’s Retinue may take no other actions. In the turn after the alarm is raised they become active, and act as the player wishes. For Wolf to succeed he must remain focussed on mayor John and may do nothing else, but he is free to act as he wishes at any time. If a member of the HRT enters the room containing the retinue, they immediately become active and may be used in the same turn.